Konami Digital Entertainment has shared information on Dark Neostorm Special Edition, the premium release that follows the upcoming Dark Neostorm Booster for the Yu-Gi-Oh! Trading Card Game. 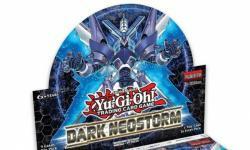 The Dark Neostorm Booster will release on May 3 (see “'Order of the Spellcasters' and 'Dark Neostorm' Join 'Yu-Gi-Oh! TCG'”).The Dark Neostorm Special Edition arrives on June 14 with 1 of 2 Super Rare variant cards, and 1 of 2 Super Rare variant preview cards from the Summer 2019 booster set. Dark Neostorm focuses on the Xyz Summoning with Super Quantum mecha pilots, a new Link Monster variation, new cars for Destiny HERO Decksa new Fusion Monster, and it also offers cards for different strategies and situations. The Dark Neostorm Booster Special Edition includes three Dark Neostorm Booster Packs, 1 of 2 Super Rare variant cards, and 1 of 2 Super Rare variant preview cards.